German Socialist Bernd Lange, who said procedural rules would stop Le Pen grandstanding or using sessions for publicity, also warned that an investor-state dispute settlement mechanism should be dropped from TTIP. If it wasn’t, he said, the Parliament’s next resolution on TTIP could be negative. Separately, Committee on International Trade vice-chair and French Green Yannick Jadot, and former European Commission President candidate Ska Keller, a committee member, yesterday called for the European Commission to be stripped of its TTIP negotiating mandate. The Parliament’s Committee on International Trade (INTA) was enlarged by ten seats to 41 since the last Parliament, reflecting the importance and interest in the landmark pact. Former commissioners Viviane Reding and Olli Rehn, representing the European People’s Party and the Liberals, are among its members. Many will back the deal. The European People’s Party has two vice-chairs on the committee, Tokia Saïfi and Iuliu Winkler, of France and Romania. The final vice-chair is the Czech Jan Zahradil, of the European Conservative and Reformists, which is in favour of the deal. The committee must prepare a report on TTIP for the full Parliament, which will eventually vote on whether to accept the deal once it is finalised. EU and US negotiators are currently in Brussels for the sixth round of talks. Brussels and Washington hope to conclude negotiations by the end of 2014. Experts said that there should be enough support to pass TTIP in plenary, despite ongoing concerns about the transparency of the negotiations, investor-state dispute settlements (ISDS), food standards and data privacy. Conservative, liberal and socialist groups welcomed the start of the negotiations in May 2013, with a 460 majority in a European Parliament vote. US Ambassador Anthony Gardner told EURACTIV, “We still think that there is well over 50% of MEPs that look in favour on TTIP. Le Pen, the leader of France’s National Front, has argued vehemently against the EU-US trade deal and is one of the highest profile MEPs on the committee. 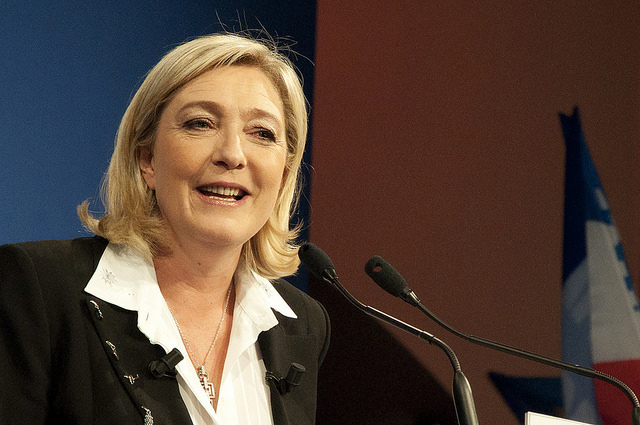 On the European election campaign trial, Le Pen promised she and her MEPs would fight TTIP. “The numerous representatives that we will send to the European Parliament will lead the battle against the Transatlantic Trade and Investment Partnership,” she said in February. Le Pen will have limited influence on policy because she is not a chair or vice-chair on the committee. She will have allies on the committee, all of whom were prepared to form a far right parliamentary group led by Le Pen. They are Matteo Salvini, leader of Italy’s Lega Nord, and Franz Obermayer, from Austria’s Freedom Party. Like any member they will be able to make amendments to the report but they will have to be passed by the rest of the committee. Because Le Pen failed to form a parliamentary group, she is not entitled to have a shadow rapporteur on the file, like the mainstream parties including the Greens. Meanwhile, Keller and committee vice chair Jadot yesterday supported a European Citizens Initiative registered by campaigners Stop TTIP. The initiative is a way for citizens to call on the Commission to make a legislative proposal. Stop TTIP demanded the executive asked the Council of Ministers to repeal the executive’s negotiating mandate. In a joint statement, Keller and Jadot said, “There is a growing sense of unease and concern among European citizens and civil society […] This concern reflects the broad scope of the negotiations and their possible implications on European standards, and is reinforced by the opaque negotiation process. The Commission can reject a citizen’s initiative even if it has widespread support. In January, the European Commission postponed negotiations on an investor-state dispute settlement mechanism in TTIP. It launched a consultation in response to opposition to the ISDS clause. It would have empowered EU and US companies to lodge private legal cases directly against governments. US corporations could bypass EU courts and directly challenge governments at international tribunals, whenever they find that laws in the area of public health, environmental or social protection infringe their right to do business. Yesterday Lange told Berlin daily Tagezeitung, “I can only recommend the European Commission waives ISDS,” before warning if it didn’t the next Parliament resolution on TTIP could be negative.He also said that civil society organisations’ concerns over the trade deal must be heard. The GUE/NGL group has called for an immediate halt to the negotiations (here). It has three members on the committee Italy’s Eleonara Forenza, the Netherlands’ Anne-Marie Mineur and Germany’s Helmut Scholz. Tiziana Beghin and David Borrelli, from Italy’s Five Star Movement, are thought to be hostile. Their Europe of Freedom and Direct Democracy group allies in the UK Independence Party would likely abstain, sources told EURACTIV. Other Parliament committees such as the Civil Liberties Committee also have a say over the deal, which should be the biggest free trade agreement in history. Negotiations between the US and the EU on the Transatlantic Trade and Investment Partnership (TTIP) started in July 2013. Since then there have been European elections and a new European Parliament has been formed. If successful, the TTIP deal would cover more than 40% of global GDP and account for large shares of world trade and foreign direct investment. The EU-US trade relationship is already the biggest in the world. Traded goods and services are worth €2 billion. Press release: GUE/NGL demands TTIP talks be put on hold: real democracy now!